Monifieth Befrienders is a registered charity – SC030685. Our organisation has been running successfully in Monifieth since 2000, providing a growing befriending service to socially isolated older people, bereaved people of any age and people in care homes. Our trained volunteers provide one-to-one quality time to their Friends that is often not otherwise available. Our organisation also holds regular social events throughout the year allowing our Friends and volunteers to meet up and enjoy social activities together. A group of volunteers meet every Tuesday morning in Servite House, High St, Monifieth, 10 am – 12 noon, to enjoy a bit of company whilst knitting or crocheting. 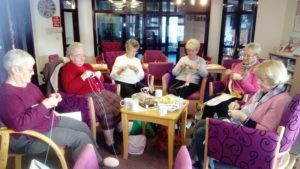 You don’t have to be part of Monifieth Befrienders to attend, just come along with your knitting and join in. Beginners welcome, too. Our new weekly Friendship Club for over 70’s will be up and running at the beginning of March 2019. Full details will be announced in the next few weeks. 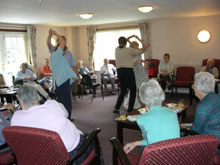 We are funded by the Big Lottery Fund, Robertson’s Trust and Angus Council Integration Care Fund.